I was lucky enough to spend the better part of last week at the Open Source Developers Conference, or OSDC, held in Sydney between Wed 3rd and Fri 5th of December. I wasn’t sure what to expect from my first OSDC conference – they’ve been running for five years, and we’ve had at least one rep from Internetrix, and now Hiive Systems, head along since the 2nd one. From a business perspective, I’m a big fan of Open Source Software. As the provider of a range of hosted, software-as-a-service style offerings, however, I’ve been a little constrained in what I’ve been able to have our talented team of developers put back into the Open Source community; so far, it has just been participation and help in forums and such. While it is a legitimate refrain from members of the Open Source community to ask businesses to Open Source their applications and make them freely available, the service/hosting nature of our business makes this impossible. For example, we’ve already had a Chinese based company knock off our entire website design, and if we shared our code verbatim, we’d likely have knock-offs appearing everywhere and destroying any chance we’ve got to recover our significant, sunken investment. For the clients that licence our software to run on their own servers, however, we provide them with access to the source code; partly its a peace of mind things given some of our clients are very large, and partly its about giving them control of their own destiny. They of course undertake not to redistribute it. So, given we don’t open-source our apps, I wasn’t sure if I would be burnt at the stake or derided as a leech who takes and doesn’t give anything back when I arrived on Wednesday. As it turned out, while the community quite rightly has a level of religious zeal towards everything being free and available, there was a much stronger sense of support between participants in the community. The desire to provide mutual support to others that came through much more strongly than I’d ever seen at a conference, in both the presented sessions by day and social activities of an evening. In this sense, the emphasis was much more on the free and open exchange of ideas and suggestions, and there most sessions I participated had presenters asking for tips and suggestions on how to improve their own approaches to solving problems. 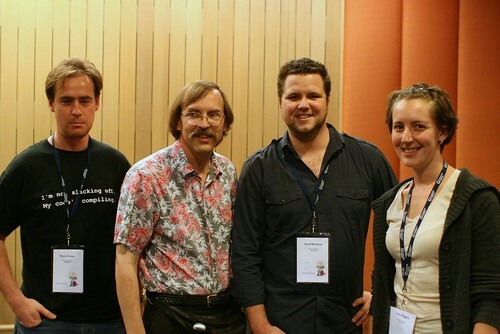 One of the sessions that surprised me the most was a business session run by MySQL guru, Arjen Lentz from Open Query. Arjen’s previous two scheduled sessions were full of great advice and tips – at both a high and at a detailed level – on how we can build a better business with MySQL. Needless to say I had high expectations coming into his third presentation on the Friday afternoon, which continued the concept of architecting for success, just in case. Arjen said straight up that he didn’t expect to have three talks accepted to the proceedings, and that the session would be much more of a forum style chat about business things. Unfortunately, the content wasn’t very good, and it seemed to highlight somewhere we may be able contribute and give something back: in the business sphere of things. Hopefully, the siliconbeachaustralia.org initiative will help provide a welcoming, friendly environment for excellent technologists to deepen their entrepreneurial and business skills, and I’ll be looking for any ways to contribute there. From a code contribution point of view, we have already picked at least two ways we can contribute; things that we think may be useful for the broader community. One of them is a real-time query format translator between MySQL formatted queries – which rely on built-in functions like CONCATENATE and different ways of using LIMIT – and MSSQL server. The other is a more ambitious project, to leverage our exposure to Google Analytics and Google Website Optimizer, and our own internal needs to integrate more closly with the whole Google Apps ecosystem, and contribute the Perl code we write to interface with GData sources back to CPAN. We’ve also now made personal connections with a number of the luminaries in the Australian Open Source community, and with people to talk to about contributing, who can give us access, we’re much more able to play a part. Stand by for some updates in a month or three as some of these contributions take shape, and thanks again to the organisers who manage to run such a professional, well attended event for what is a seriously (comparatively) low ticket price.